The word Songkran derives from the Pali language of the Buddhist scriptures.In Pali the word Sankhara, or Sankranti inSanskrit, refers to the movement of the sun from one sign of the Zodiac to another, here from Aries to Taurus. The word changed to Sangkan in Thai, and later to Songgran (Thai pronunciation) or Songkran (writing habit). The Northern Thai people have their own folkloric explanation for the origins of the word. Songkran day itself is called Wan Sangkhan Lohng, and the day of the new year is called Pavenee Pee Mai. Wan Sangkhan Lohng is, according to local legend, the day that Lady Sangkhan passes by, as the word lohng means to ' go away' or 'pass by'. Technically it is the last day of the Lanna Lunar calendar, and the start of Pavenee Pee Mai. 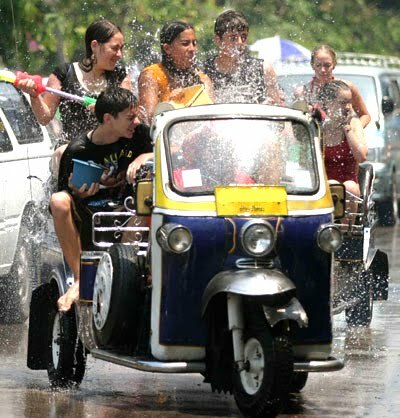 The festival stretches over four days with Songkran day officially set on April 13th, 2003. Each day has its different focus and activities. April 13th Wan Sangkhan Lohng. People clean their houses and prepare for the new year festival on this day. The Chiangmai Songkran parade traditionally takes place on this day involving revered Buddha images from the city's temples, floats, representative groups from the various districts of Chiangmai province, musicians, and traditionally costumed beauties all of whom are liberally drenched all along the parade route by the spectators. April 14th Wan Nao. On Wan Nao people prepare cooked and preserved food to be used in Buddhist merit making on the next day. On this day people also go down to the Ping River to collect buckets of sand which is used to construct molded sand chedis, decorated with cut paper streamers and flowers, in the temple compound. When demolished, the sand from the chedis raises the level of the temple courtyard. April 15th Wan Payawan. On this, the first day of the new year, people gathered at the wat in the early morning to offer the food prepared the previous day, fruit, new robes, and other goods to the monks. Traditionally this was the day when subdued water play started, but this has devolved to the exuberant water throwing that stretches over the four days of the festival. April 16th Wan Park Bpee. On this day people pay respect to their ancestors, elders, or people worthy of respect due to advanced age or position. Scented water is poured over the hands of the individuals being paid respect who in turn bless the participants in the ceremony. The over enthusiastic water play in which visitors to Chiangmai heartily participate on their first experience in Chiangmai represents a development of customs relating to the celebration of the Thai lunar new year. In some people's viewpoint it has become excessive and many prefer to remain at home with a good book or a video rather than expose themselves to a daily drenching. In the past people might sprinkle a bit of scented water on your shoulder to wish you a happy new year, but this has deteriorated to getting dowsed with a bucket of ice water by an individual on the back of a moving pickup truck. One of the important customs of the festival was to pay respect to elders and persons worthy of respect by pouring lustral water over their hands in the ceremony called rod nam dam hua. Family members and subordinates will approach those who are to be honored during the ceremony with a vessel called a khun oh containing water that has been scented with dried flowers, cumin, and other ingredients. Participants in the ceremony then pour a small amount of this lustral water over the hands of those being paid respect into a large red lacquered bowl while saying formal words of respect. Those receiving respect were also presented with an indigo dyed traditional mor-hom shirt, the multipurpose length of plaid cotton call a pakamah, and other items. A representative of the participants in the ceremony would then address the elders receiving respect asking them to excuse any disrespectful attitudes or misbehavior by the participants in the ceremony during the previous year. The elder would then dip his or her hands in the lustral water and rub them along the sides of his or her head while blessing the assembled participants in the ceremony. Finally, the entire group goes to the temple for a seub chadta, or 'life prolonging' ceremony. Later, there emerged the habit of gently sprinkling scented water on the shoulder or back of friends as you wished them Sawasdee Pee Mai (Happy New Year!). From these humble beginnings has now evolved the current practice of the liberal and vigorous throwing of water; drenching, soaking and dowsing any and all who venture forth during the four days of the Songgran Festival, from morning until sundown. No one is immune, not even the participants in the traditional Songgran parade, which ends at the official residence of the Governor of Chiangmai, nor the governor himself, who gets drenched when he and his wife address the assembled sopping-wet marchers at the conclusion of the parade. Nowadays the focus of Songkran has become the wholesale water play throughout the four days of the event. It is a wet and wild Songkran water throwing. Inside the city limits water play is restricted to the official days of the festival, but rural children dowse unwary motorcycle riders at country road intersections for as long as two weeks in the days surrounding the festival. While the gentle customs of former times have changed, or even gone ballistic in the present day Songkran festival, get into the spirit of thins. Get wet, keep a cool heart as the Thais say, and enjoy one of Thailand's more frenetic, fun festivals.